We offer drumming as part of a Team Building exercise. Drum Circles at a Private Party or Function. Drumming Performances for your entertainment. 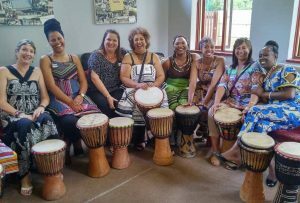 Drum Circles and Private Tuition. We run a Children and School Program. Drum Sales and Repairs at competitive prices. 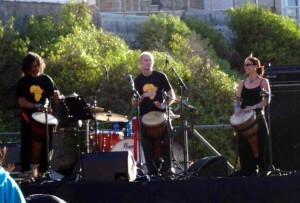 The djembe drum has a great cultural heritage in Africa. It is the drum of the Mandinka people and it’s origins date back to the great Malian Empire of the 12th century. Of all the African drums the djembe is regarded as the most popular and is now found all over the world. The drums are carved from a single log, and the head covered with goatskin to provide deep thunderous low tones and crisp high tones. The drum rhythm is performed at most celebrations like weddings, harvesting crops, initiation ceremonies and festivals. A master djembe drummer is referred to as a djembefola. 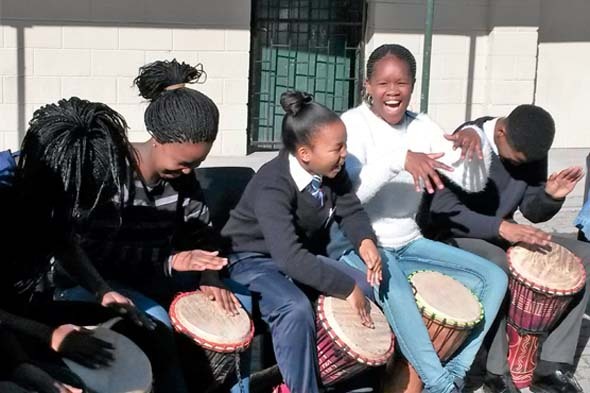 The benefits of djembe drumming are numerous, the most well-known being stress reduction. Studies have also shown that regular participation in a drum circle helps boost the immune system. What better reason to beat the drum!! Audio recording of Raboday from our drum circle.